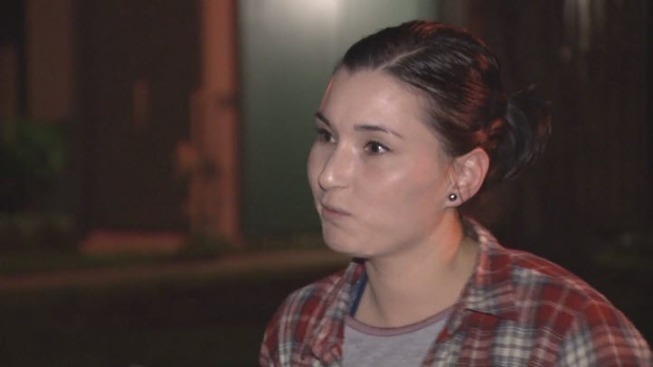 A quick-thinking passerby helped get an 89-year-old woman out of a burning San Jose house late Tuesday night, while the other three occupants were able to get out themselves, a fire captain said. Capt. Mike Van Elgort said because of the passerby's actions, no one was injured during the three-alarm blaze reported at 11 p.m. in the 3200 block of Ensalmo Avenue. The passerby, Amber Pacheco of Fremont, was dropping a cousin off in the area and pulled over when she saw the flames. The caregiver said she ran to the house and quickly learned the family's grandmother was in the backyard. "They were screaming. They were scared," Pacheco said. "I jumped on the fence." Pacheco said she found the elderly woman trying to put out the fire. "She was holding the hose," Pacheco said. "She was going to get that fire down. I was shocked." Pacheco was able to get the grandmother to leave with her. Other people also made it over the fence to help. Surrounded by flames and smoke, Pacheco said she and others kicked a hole in the back fence and rushed the woman to safety. "She saved her life," neighbor Beth Sabic said of Pacheco's heroic action. Sabic remembers hugging a woman named Amber and thanking her for saving a life. "It gives me chills. It makes me happy, thankful there are people out there willing to risk their life to save someone else's life," Sabic said. The blaze, which started in the garage, was declared knocked down at 12:20 a.m., Van Elgort said. Pacheco on Wednesday was feeling the effects of breathing in a lot of smoke, but said the risk she took was worth it. "Feels good," Pacheco said. "I would do it again."